The final programme from Cross Hills Picture House for January and February 1968. Many thanks to Bryan Gill who kindly provided the programme. This was well patronised by local villagers when opened in 1913, with seating for 800, under the management of Mr Charles Nuttall, who always wore a flower in his buttonhole. Admission was 2d to 6d (1p to 2½p). For taking a younger girl from North Road to school, I received 3d (1½p) - this paid for my Saturday matinee visit and sweets in the 1930s. In the early years Mr Colin Spencer played the piano during the arrival of the patrons and, for silent films, Miss Nellie Simons would play her violin, with appropriate music for the action taking place. For many years the Huff sisters, Charlotte and Chrissie assisted in the pay box. During the winter months an open fire burnt in the main reception; eight showings took place. All the boys sat in the cheaper seats "spit & whistle" on the left side of the screen. A girl was thought very forward if she sat there, with courting couples on the back row. It was not unusual for a short breakdown, amid much bantering. 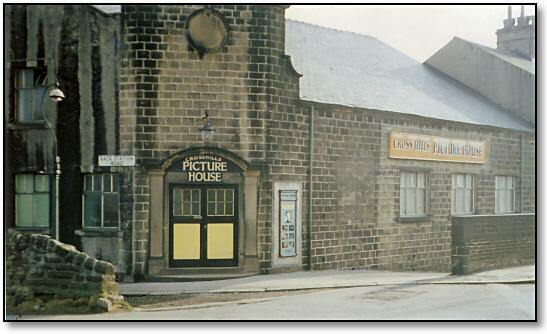 A bus service from Lothersdale came on Saturday evenings, long queues forming for the shows. The evening ended with the playing of the National Anthem.